It’s that season again: ahead of the final quarter of the year, oil markets are once again riled by an event that will have a major effect on prices. Last year and the year before that, the market-riling events were OPEC meetings focused on production curbing. This year, it’s the Iran sanctions due to snap back in early November that has oil markets stirred. As the date nears, traders and analysts spew price forecast after price forecast with a growing number of these in the bullish end of the ring. Many are saying that Brent will hit US$100 a barrel before the end of the year for the first time since 2014, with some forecasting the U.S. sanctions could remove 2 million bpd of Iranian crude from global markets. That’s certainly a major upward revision on earlier projections that mostly hovered around 1 million bpd of Iranian oil being cut from global supply at most. Yet the actual effect of the sanctions remains uncertain even with less than two months to go. OPEC—as represented by Saudi Energy Minister Khalid al-Falih—and Russia seem to think the market is in balance and no further production boost is necessary. Russia’s Alexander Novak said this week that the last quarter of the year was a period of lower oil demand so current production levels should suffice. But what about the Iran sanctions? China will continue importing Iranian oil. So will India, paying for it in rupees. The European Union also came up with a solution to the sanction problem: the EU will set up a special-purpose vehicle for trade with Iran. Reuters quoted European diplomats as saying the SPV will basically be used to process barter payments, avoiding the use of dollars in bilateral trade. What does this all mean for oil prices? For one thing, it means Iranian oil exports will not be reduced to zero. The 2-million-bpd scenario is unlikely to play out. The 1.5-million-bpd scenario may have a better chance, but only if the United States somehow persuades India to cut all Iranian oil imports, which is quite unlikely. Europe and China have found ways to circumvent the sanctions. One wonders if Novak and Al-Falih knew something the rest of us don’t about the Iran sanctions when they said the market was in balance. Paragraph 1: Mentions that at this time of year in 2016 and 2017 and again now in 2018 prices have come up. Translation: OPEC+ is tired of prices declining after Labor Day, so they jawbone their way up. Paragraph 2: Mentions how big banks are talking about Iran sanctions will soon cause a $20/bbl increase to $100/bbl. Translation: Hedge funds will do the bidding on behalf of OPEC+ as they can soon profit $20,000/contract doing so. Paragraph 3: Mentions that 1.5 million bpd will cause Brent to go to $100, despite current global production of 100.2 million bpd and demand < 100 million bpd. Translation: Because $100/bbl is unsustainable, this spike will will be short-lived as those same hedge funds will all take profit and then short the market. Paragraph 4: India's refiners will import less crude due to already high prices. Translation: Soon to be the world's most populous nation has already shown a decline in demand, yet prices will still go to $100?! Paragraph 5: Both Saudi & Russian energy ministers believe the market is already balanced, and will continue to do nothing. Translation: The world's greediest producers want more money while doing less, despite stating that the market is already balanced. Paragraph 6: Both South Korea and Japan have already stopped buying oil from Iran...China and Europe are still buyers of Iranian crude. Translation: Demand has already fallen, and those countries are doing fine...but don't tell that to hedge fund managers! Paragraph 7: China, Europe, and India will apparently still buy Iranian crude once sanctions kick-in, but they will just not use U.S. dollars to buy it. Translation: There is no problem with U.S. sanctions on Iran, so stop with with all the daily headlines to jawbone prices! Paragraph 8: Evidently, everything will be just fine according to the Saudi & Russian oil ministers. Translation: So, why are we bothering to go ahead with massive price increases in oil? One factor is that the fundamentals of the global oil market are robust enough to support an oil price rising even beyond $85 before the end of the year. And while Japan and South Korea might have reduced their Iranian crude oil imports ahead of the US sanctions on Iran, China and India which account for 68% of all Iranian crude exports are increasing their imports. Moreover, the European Union (EU) which accounts for 20% of all Iranian crude exports has no intention of complying with US sanctions and it is already setting up a mechanism to evade US sanctions and continue trade with Iran. 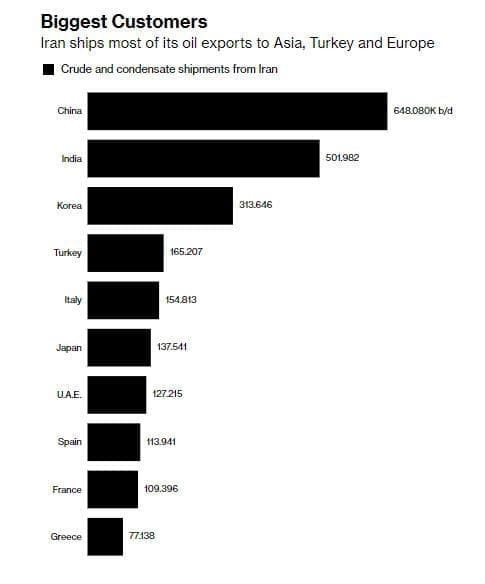 Then there is Turkey which accounts for 7% of Iranian crude exports and which has already declared that it doesn’t recognize US sanctions against Iran. All in all 95% of Iranian oil exports will bypass US sanctions leaving only 5% imported by Japan and South Korea and even these could get a waiver from the US. That is why US sanctions are doomed to fail and Iran will not lose a single barrel from its oil exports. And contrary to claims by various analysts, an oil price of $100 a barrel is definitely sustainable given the strength of the global economy and the robustness of the global oil market. Still, a fair price of oil ranges from $100-$130 a barrel. Such a price is good for the global economy in that it stimulates global oil investments, it also enables oil-producing countries to get a reasonable revenue and thus spending more on exploration and expanding their oil production capacity to meet future demand and it also enables the global oil industry to balance its books and start new projects.